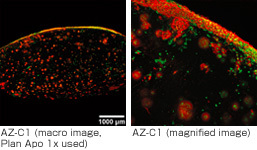 The AZ-C1 enables high-definition confocal imaging during macro observation as well as micro observation. Sharp wide field of view images with unprecedentedly high S/N ratios allow for imaging of whole-mount specimens such as embryos and large tissue slices that are commonly used in developmental and systems biology studies. Moreover, the AZ-C1 offers a combination of low and high magnification objective lenses and a scanning zoom function, enabling continuous imaging from macro to micro with a single microscope. New macro in vivo imaging capabilities allow for the capture of confocal images that were previously not possible with traditional stereoscopic microscopes. The AZ-C1 eliminates out-of-focus light and flare to deliver highly resolved confocal fluorescence images and optical sections. High NA objectives for macro observation enable fast, high-resolution, single-image capture of a wide specimen area. Because the objectives cover a field of view larger than 1 cm, imaging of embryos during late stages of development and the dynamics of cell populations in whole organs are possible. Note: When Plan Apo 1x and AZ100 optical zoom 4x are used, the diagonal diameter of the real field of view is 5.3 mm. The AZ-C1 can capture wide-field, optical sections at high resolution in a single scan. 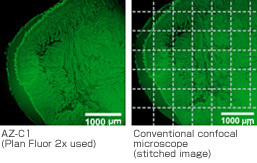 With a conventional confocal microscope, image stitching is necessary because the field of view that can be captured in a single scan is small. 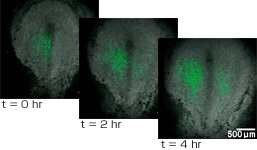 The AZ-C1 allows time-lapse observation of the dynamic behavior of cell populations. Specimen: Chick embryo in stage IV (Plan Fluor 2x used) expressing GAP43-eGFP to label plasma membrane. With five different objective lenses, optical zoom and confocal scan zoom, the AZ-C1 makes imaging possible from very low magnification to high magnification. 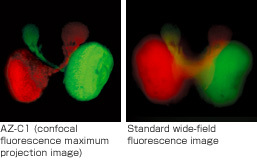 Macro imaging, such as whole-section imaging, and micro imaging, including imaging of a single cell, can be done using a single microscope. 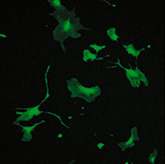 High magnification imaging offers clear and sharp images of single cells. 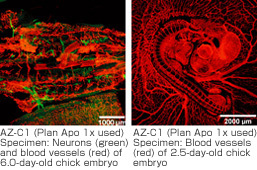 The AZ-C1 allows imaging deep into the specimen?difficult to achieve with conventional confocal microscopes. 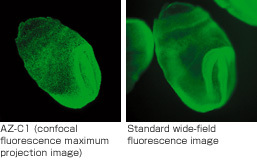 The AZ-C1 efficiently captures fluorescence signals from deep within a specimen in macro and in-vivo imaging. 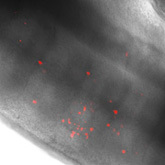 Nerve cells (red) 2 mm beneath the surface of the embryo can be imaged clearly. The Nikon C1 series offers the optimum confocal system to meet both your research and your budgetary needs. C1plus: Standard model boasts high resolution, high sensitivity, and high contrast. Suited for single laboratories or large research groups. C1si-Ready: Upgrade to C1si is possible by adding a spectral detector. 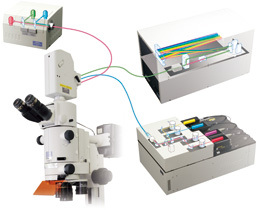 C1si: Spectral confocal system featuring a 32-ch multianode spectral detector. A spectral bandwidth of 320 nm can be captured in a single scan. Note: Upgrade to macro confocal microscope system AZ-C1 through combination with AZ100 microscope. Product image does not include the laser safety stage cover. The laser safety stage cover should be attached during actual use. The diascopic detector is under development. Sample images captured with the prototype only. AZ-C1 is a combination of the AZ100 microscope and the C1 series confocal laser microscope system. The AZ100M and A1 series are not compatible.